About a week ago, Sammy the Siamese Cat spent the night at our house. Well, he's back and probably here to stay. Jen and her mother brought him over Saturday, and we think he's settling in now. Saturday night was a little rough - Sammy is able to open doors (we have those lever-style door handles) and he tried to get out of Erica's room between the hours of 3 and 5 am. Finally, at 5am, Scott and Erica relegated him to the basement. He's been spending his nights there. We keep the basement door secured closed with a 20 pound weight. 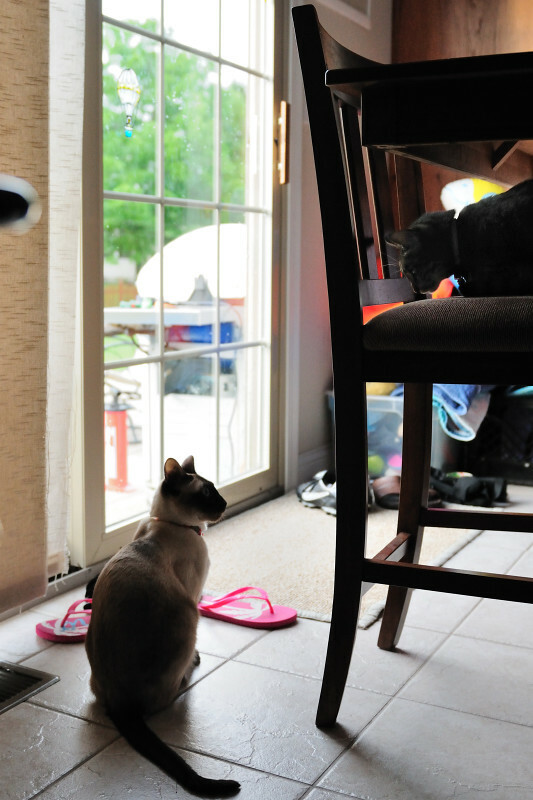 It's not the clearest picture, but Hannah is perched on the chair cushion, looking down at Sammy. Here's to hoping they get to be friends.